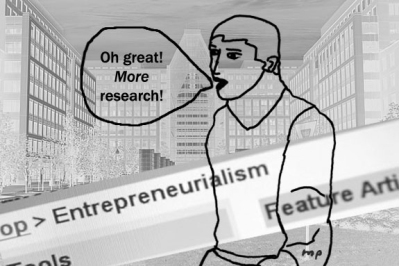 How Do Inventors Go To Market? (Part 5) Become An Entrepreneur! It's hard work being an inventor!That final patent award with its gold seal and red ribbon may make a neat keepsake to show off to your kids and grandkids, but unless you have several thousand dollars to available to you, only go the patent route if you have a comprehensive achievable plan to make a lot of money on your invention. Your patentability opinion may scream out "GO PATENT! ", but if you don't know how you're going to make money on your invention, or you no longer have enthusiasm for developing the idea, or you have not received positive responses from prospective licensees... you should not spend the time and money to proceed with a full patent application. At least wait until you have the inclination and some external support. And it's true, as many of you have surmised, that unless you or your licensee is willing to defend your patent in court, you have little leverage against invention thieves. Prosecuting a claim against your violator is not cheap either; you may have to file a complaint in a special patent and trademark court through a patent litigation specialist. You might as well face it now. If you put out a neat new product and it's successful, someone's going to copy it; some will get around your patent successfully, others will be so bold as to rip you off, piece by piece, even up to your packaging. But, if you have the wherewithal to defend the patent, a financially successful invention will reap far more than it sows. So, what do you do if you don't have that kind of dough but you have a strong desire to get your product to market? You're going to make a big wide splash with or without a patent! Let's go back to "square three." Reme mber? 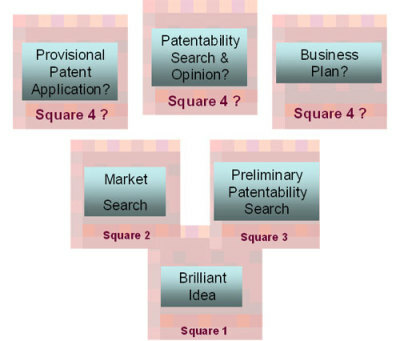 But, if you want to go straight to the market, and cannot afford to and/or are not interested in going for a full patent (i.e., the non-provisional patent) then Square 4 is the entrepreneur's foundation... the business plan. Why? Because you need to see how you are going to get from your idea to your tons-of-money-making product! Just like you need a map to know how to get from your home in Wichita to your friend's home in Great Neck. No, you can't just Google this map. You need that Sherlock spirit to rise again as you do some more research on different aspects of your invention... information you need to put your plan together. Perhaps later, your business plan will become an argument for why an investor, licensee, or partner should be interested in helping you make it happen, but for now it's just going to help you get from A to Z... to help you think clearly and specifically about all the aspects involved in putting your invention in a customers possession. Design Razor’s Latest PowerWing Scooter, Win Big! Each segment gets better and better. Wonderful advice! I know yours is the entrepreneurial way, Roger. It's super to get your feedback... nothing like the support of another inventor... Thank you very much for taking the time to comment.